Most babies have normal hearing, although a small percentage of newborns have some degree of hearing loss after birth. Since newborns aren't able to verbalize, such tests are important to detect possible hearing issues at a time when early intervention is possible. Nearly half of all younger patients with hearing loss have no prior risk factors (e.g., family history of hearing loss) before hearing loss is diagnosed. What Hearing Tests Are Performed on Newborns? There are two standard hearing tests typically performed on newborns. The first is an automated auditory brainstem response (ABR) test. During the test, soft earphones are placed on the baby's ear. Tones or clicks are produced to determine how the hearing nerve reacts to these sounds. Electrodes are also placed on the head of the newborn to detect how the nerve is responding. 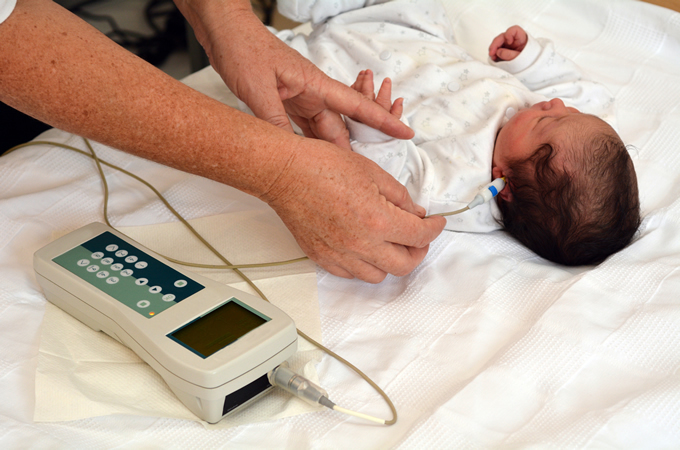 The other hearing screening commonly performed on newborns is an otoacoustic emissions (OAE) test. Sound waves generated from within a baby's inner ear are measured with a probe positioned into the ear canal. Specifically, the test measures the echoes produced by the sounds delivered into each ear canal. ABR and OAE tests only take about 5-10 minutes to perform. Both tests are painless and often performed while the newborn is calm and relaxed or sleeping. What if Newborns Fail One or Both Tests? The American Academy of Pediatrics (AAP) recommends that newborns have a hearing test shortly after birth before going home from the hospital, although universal newborn screening is already a common practice in U.S. hospitals. The American Academy of Audiology recommends that screenings for permanent hearing loss continue for children 3-5 years of age since some screenings cannot be used reliably on children under the age of three.